Those are some fun non-conference December games, which are not always guaranteed, especially in this odd time period with finals weeks ending, the holidays upcoming, and conference play less than two weeks away. Enjoy today, it’s a fun lineup. Before I dive into my picks for today, let’s review how I’m currently doing with my picks. Here were my picks from last night (click image to expand in new tab). I’m currently just over .500 on Big 12 picks against the spread. In non-Big 12 games, I’m just barely under .500 to put me slightly above .500 overall. I’ve been basically ho-hum over the last week or so, and with not as many games to pick, there hasn’t been much movement in my record. 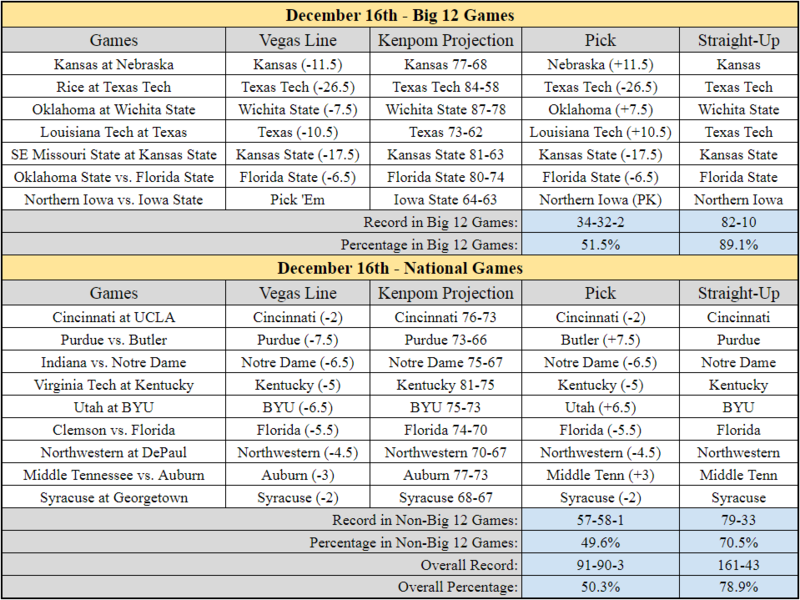 That should change today as I’ve made 15 picks against the spread — six alone in the Big 12. Here are those picks (click image to expand in new tab). Lines are from VegasInsider as of 3:00 PM on Friday, December 15th. • This might be one of the best PG matchups yet this season. You’ve got the front-runner for National Player of the Year right now in Trae Young facing preseason first team selection in the American Conference, Landry Shamet. Shamet currently has an Offensive Rating of 140.1, per Kenpom, which is the 12th best in the nation. He’s shooting 54% from 3-point range. His shooting splits on FTs/2Ps/3Ps is .909/.571/.535. He’s playing tremendously. It’s the toughest matchup Trae Young has faced yet this season. • Looking at the matchup between these two teams, two things stand out. The first is tempo. The number of possessions in this game could dictate who’s ahead on the scoreboard at the end. Oklahoma wants to play at a lightning fast pace, which Wichita State is more ponderous on offense, with an average possession length of 16.8 seconds. If it feels like Oklahoma is pressing at times with how quick they’re shooting, don’t be surprised. That’s their style this year. • The second thing that stands out to me is the strength of Wichita State’s offense, along with their effectiveness from 3-point range. They have the 6th best Adjusted Offense in the nation, per Kenpom. They’re a terrific shooting team — shooting nearly 40% from 3-point range as a team. Oklahoma allows far too many 3-point attempts. They are 272nd in the nation in defensive 3PA/FGA. They’ve got to be aware of shooters today and close out hard. Otherwise, the Shockers could really punish them from deep. • I’ll take Oklahoma to cover the 7.5 point spread, but think Wichita State should win. • This is a difficult “get-right” game for Kansas after losing two straight. Nebraska isn’t good, but they can frustrate Kansas with their style of play. They are not afraid to slow it down and muddy up the game. Lincoln is also a difficult place to play. It will be a rowdy atmosphere for the matchup between former Big 12 rivals. • Ultimately, I don’t think Nebraska’s offense will score enough. They have the 126th ranked offense in Kenpom, facing off against Kansas’ 8th-ranked defense. But I think the Huskers will keep it close enough to cover the 11.5 point spread. • Northern Iowa has consistently given Iowa State fits under Ben Jacobsen. Jacobsen has a 6-2 record all-time against Iowa State, and his two losses came in overtime. His style of play directly contradicts what Iowa State wants to do. Northern Iowa will play incredibly slow on offense — they’re currently 350th in the nation in average possession length on offense — and that will frustrate Iowa State, who likes to play with tempo on offense. • Northern Iowa’s defense is designed to cut off driving lanes and force you to take difficult shots. It’s Virginia-esque at times. If Iowa State is not hitting from the perimeter, they could really struggle to score. They will need good shooting games from Donovan Jackson and Lindell Wigginton. • I have no idea on this one. I’ll take Northern Iowa to win just due to Jacobsen’s continued success in this matchup. His style works against Iowa State, and with it being a neutral site arena with different shooting sightlines, I’ll say Iowa State struggles from deep and UNI pulls it out. If Iowa State does win, that would be a quality win for their resume when March rolls around. UNI is good. • Oklahoma State is traveling to Miami to face the undefeated Florida State Seminoles. This could be another tough Saturday for the Cowboys. I really think Oklahoma State’s lack of offensive creativity and individual playmaking ability could be detrimental today. Florida State’s defense is quite good — they are currently ranked 26th in Adjusted Defense in Kenpom. Florida State’s opponents struggle to find good looks against their athleticism and length. I think the same will be true for Oklahoma State today. I’ll take FSU to win and cover.